Are you looking for a cure for snoring? Is your partner annoyed by your snoring, can barely sleep, and wants separate beds? You, too, sleep badly and wake up in the morning feeling terrible? Then live dangerously. Snoring can be bad for your health. Maybe you’ve already tried many things to prevent snoring. But nothing has really helped? This could change with the Sleepring. The dream of a peaceful and relaxing sleep might be just around the corner for you. Acupressure exerts blunt pressure on specific points of the body. This method has historically been the precursor of acupuncture and uses the same meridians and their pressure points (tsubo). The World Health Organisation (WHO) classifies acupressure as a therapy under the acupuncture umbrella. Often the term acupuncture massage is used. Acupressure can be safely applied by laypeople and self-administered by pressing fingertips on the aching muscles or tendons for a few seconds. To be honest, I didn’t really think it worked! But after I had already tried many other things, the acupressure ring has completely won me over. It really works. I no longer snore. Simply select your size and finally sleep well again. A clinical study showed that snoring was completely eliminated or significantly reduced in 85% of users of the acupressure ring. In the study, 20 confessed snorers underwent a series of tests. They were also asked about the quality of their sleep. The tests were repeated twice – once with the anti-snoring ring on their little finger, and once without it. The independent study showed that 17 of the men slept better when the ring was on their little finger. They were snoring less frequently and more quietly, were less tired the next day, and their wives and girlfriends also had a quieter night. We live in a stressful society, in which the right quality and quantity of sleep is becoming increasingly important for everyone. The acupressure ring works by simply putting it on your little finger. A study shows that 80% of the subjects using the ring no longer snored or the volume was significantly reduced. The anti-snoring ring had the best results in both tests. The anti-snoring ring is worn only at night when sleeping. You can test the sleep ring at no risk and just send it back within 30 days. 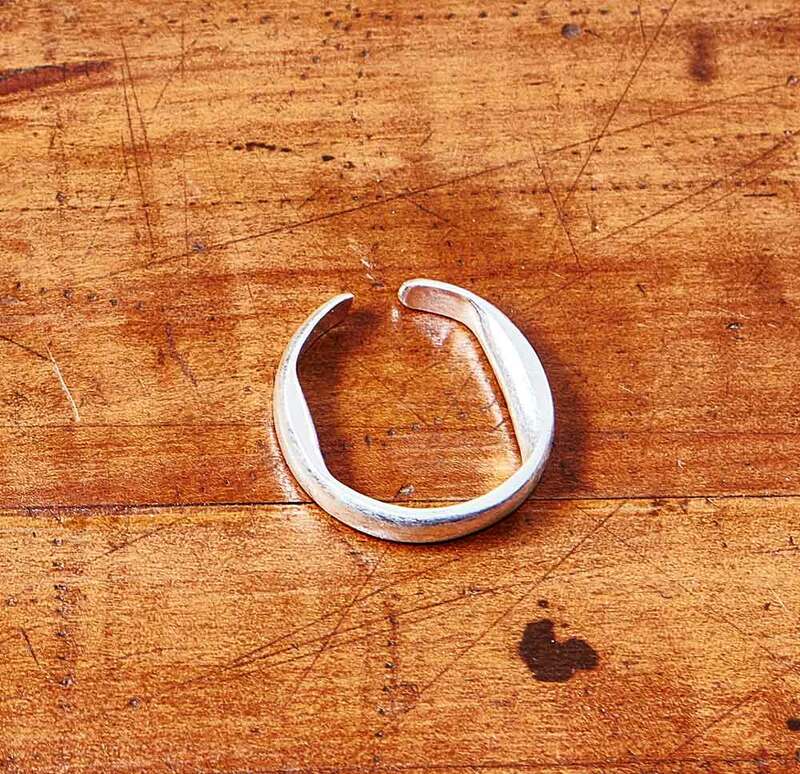 The sleep ring is available in 3 sizes. The ring is available in different sizes to best activate the acupressure points. This size is suitable for large men’s hands. This size is the most common, it is suitable for larger women’s hands and men’s hands. This size is suitable for petite hands. 90% of our customers are satisfied! Finally wonderful nights again instead of sleepless ones? My wife’s snoring has been greatly reduced. 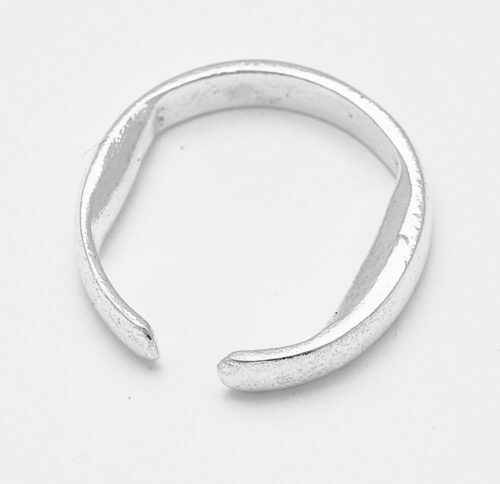 I’m very fond of this ring. Ich bin zufrieden mit der Wirkung und auch meine Freundin kann das bestätigen. I am satisfied with the effect, and my girlfriend can also attest to that. The ring worked great for me. I can only recommend it. My husband has been testing the ring for a month now. His snoring has in fact waned, but it is not completely gone. But my sleep has improved by at least 95 percent. I was very sceptical about whether this really works. I have been wearing the ring now for some time and my snoring has significantly reduced. Some nights even completely gone. Highly recommended. The ring is not a bother on my little finger. I’ve had it for a few months. Since I live alone, my snoring doesn’t disturb anyone, but sometimes I suffer from irregular breathing and this has significantly been reduced, almost gone completely. How I realised that? I turn on the tape recorder at night. I feel much better in the morning. Since I’ve been wearing the ring while sleeping I barely snore at all anymore. Thanks for a great product. It’s amazing, the next morning I’m much more rested and my partner is no longer mad at me. A simple solution that works. 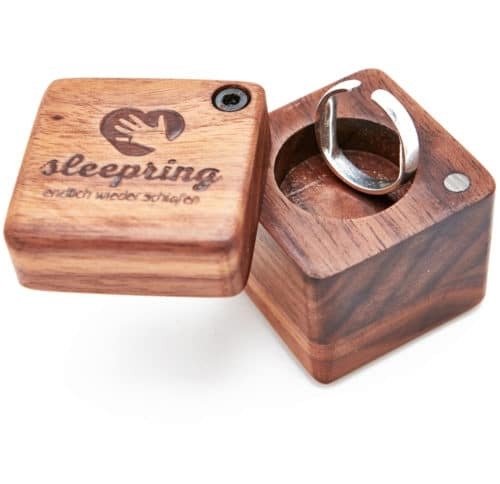 The acupressure ring is delivered in an elegant wooden storage box with a magnetic closure. Snoring can reach a volume of up to 80 decibels, making it comparable to the volume of a jackhammer. A snorer does not sleep as well as they might appear to. Science has been looking at this for some time now: When snoring, the bilateral carotid arteries are constantly vibrating. This causes long-term damage to the inner layer of these vessels, which are responsible for oxygen supply to the brain. Atherosclerosis can occur, there is risk of stroke. We have long known that snoring with apnea is a health risk. Irregular breathing stresses the body, which increases the insulin released, which increases insulin resistance and favours the development of diabetes. In general, it is important to find out the individual causes of snoring. These can be diverse. When people snore, the causes are often anatomical. A cleft lip and palate, a deviated septum, enlarged tonsils, adenoids or sagging muscles in the nose and throat area hamper easy breathing. Other causes of snoring can be obesity, drugs, alcohol, and smoking. Lack of sleep and disturbed sleep first have an impact on the psyche, on job performance and, ultimately, also on the quality of the relationship.